Most of the bugs in Windows 10 have been ironed out now – and we are recommending that our clients upgrade. However, Microsoft have taken their nagging us to upgrade (you know that annoying little reminder box that pops up at regular intervals) to a new level. If you click on the X to close the box – the upgrade will start if you have ‘recommended updates’ turned on – whether you want it to or not! Recommended updates are normally a good thing and protect your computer from the latest bugs and viruses (or should that be virii? ), but a system upgrade is a bit more serious than patches and fixes. It can mess up your account altogether. 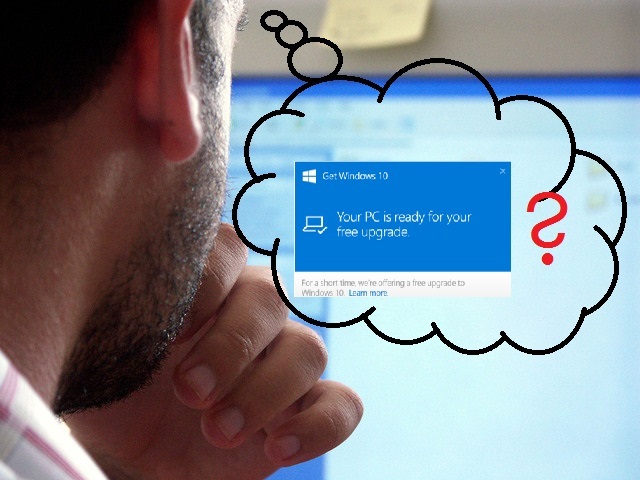 Some hardware isn’t ready for it and email can go pear-shaped in conjunction with Windows 10 without some preparation. Microsoft claim that you can still cancel the upgrade in a subsequent window, but if it starts updating without you realising what’s going on you may not even notice. A systems upgrade should be a planned event, especially if you have a network with multiple machines. Either your IT department or your IT support service need to discuss the process and check that your existing systems, applications and hardware can cope without causing problems that might cause a serious halt in your business processes. There is an application called Never 10, which can be downloaded for free from https://www.grc.com/never10.htm. The free upgrade to Windows 10 from Win 7/8 expires 29th July 2016, so, if you are thinking of upgrading you should plan to do this before it will actually cost you money. If part of your company’s policy is to prevent your staff from downloading apps from the Windows Store so they can’t slow down their computers (and their work rate if they’re playing games or exploring apps in work time), you can’t do this with Windows 10 Pro any longer. The store-blocking feature has been removed – if you still want this feature you now have to invest in Windows 10 Enterprise – which, of course, costs more! Microsoft has advised IT managers to educate users and tell them not to download games, etc. Easier said than done – and is almost certain to generate some negative feelings internally, not to mention tying up the HR team in an ‘unnecessary’ education programme.